Panasonic has introduced its new LUMIX DMC-FZ28, the 10.1-megapixel super-versatile digital camera which includes a premium 27mm wide-angle and powerful 18x optical zoom Leica DC VARIO-ELMARIT lens, along with an enhanced Intelligent Auto (iA) Mode that adds new AF (auto focus) Tracking function to track the subject once the AF has been set even if the subject moves around, making it easier to shoot sharp, well-focused photos of decisive moments. In addition, the LUMIX FZ28 also features a large, 2.7-inch Intelligent LCD with 230,000-dot resolution, high resolution electric viewfinder (201,600 pixels) as well as HD video capabilities with a resolution of 1280 x 720p at 30fps. Image Leveling – When a captured image “leans” to the right or left because the camera was held at a slight angle when the photo was taken, the Image Leveling function rotates the image to straighten it and crops the unnecessary edges. No computer needed! Scene Modes – The DMC-FZ28 offers a total of 37 scene modes to respond easily to any shooting situation. The new Pin Hole and Film Grain modes add unique, film camera-like effects and ambiences to images. Additionally, the actual effects of the scene mode can be viewed on the LCD before taking the shot. Flash – Reaches a distance of 8.5 meters at the wide setting and 5.4 meters at the telephoto setting (ISO AUTO). SILKYPIX Developer Studio 3.0 SE – Software application comes bundled with the DMC-FZ28 for editing and developing images in the RAW file format. 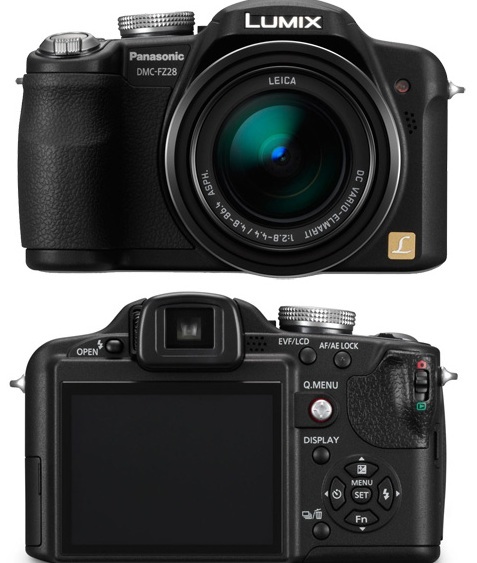 The new Panasonic LUMIX DMC-FZ28 digital camera that available in silver and black color will ship in coming August 2008 for about $400.